Count Michael Károlyi, first President of Hungary, who is to speak at the Ford Hall Forum tomorrow evening, at 7 o’clock, on “Fascismo–The Menace to World Peace” has, after a four-year period of exclusion, at last been given permission to enter America as an ordinary European visitor with a six months’ visa. Károlyi spoke about the rise of fascism in Europe and warned about its consequences. Deja vu! His thoughts are just as relevant today. Count Michael Károlyi in the United States. 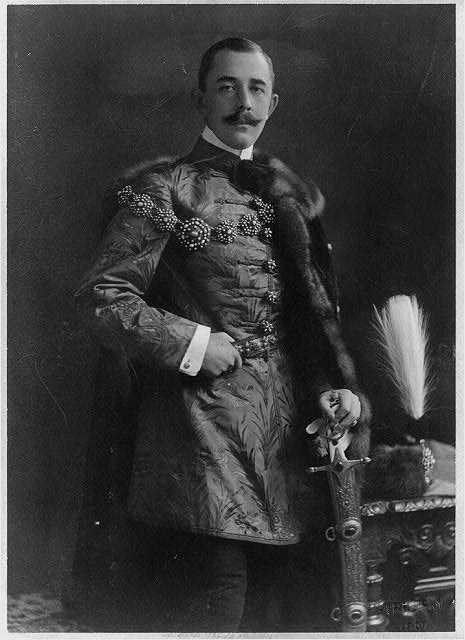 Count Mihály (Michael) Károlyi was the first President of Hungary. As a wealthy aristocrat, and the largest landowner in the country, he did something Hungary’s ruling class never forgave him for. On February 23, 1919 Károlyi gave away his own land. A delegation traveled by train to Kál-Kápolna where Károlyi started to parcel out his land in the presence of Prime Minister Berinkey and several ministers of the Government. In July of the same year Károlyi left Hungary, first settling in France, then later in England. In 1923 the Horthy regime convicted him for treason and took his land-holdings. Pro-Hitler Admiral Horthy hated Károlyi, just like the Orbán-regime does today. 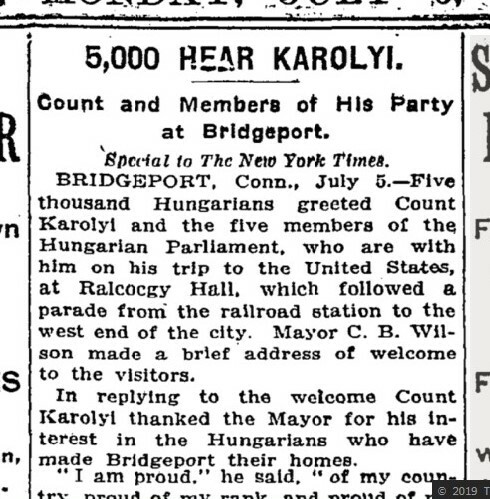 Károlyi often visited the United States and always received a hero’s welcome from Hungarian Americans. In 1914 over 5,000 of them greeted him in Bridgeport, Connecticut. 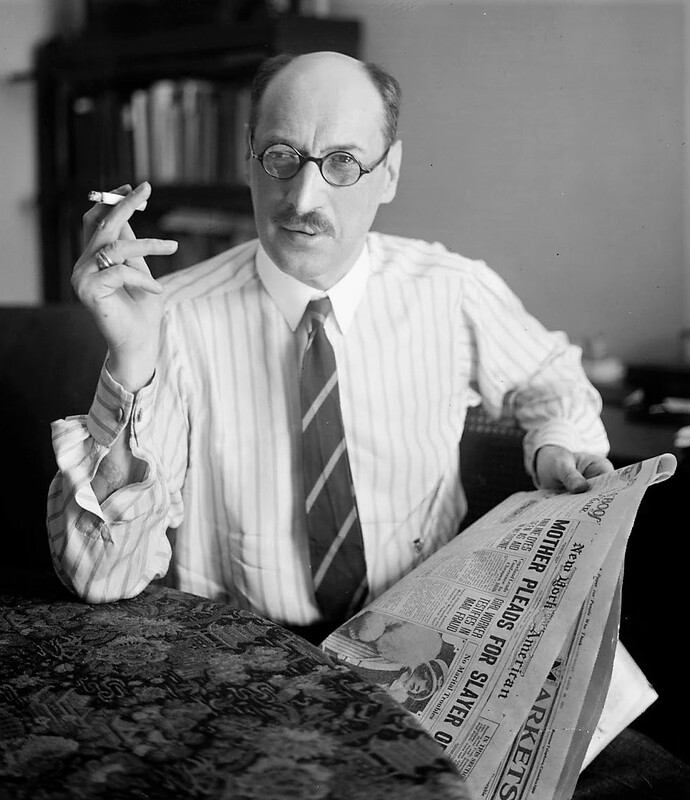 In the early 1920s Horthy surrogates started an anti-Károlyi campaign in the US. They claimed that the first President of Hungary was a “communist traitor” and called his wife ”the Red Countess.” In 1924 when Károlyi applied for a visa, the State Department imposed a gag order preventing him from giving political speeches. Later the Károlyis were denied entry without any reason given. While Károlyi remained enormously popular in the US, he also had powerful enemies. Among them Horthy’s ambassador in Washington, Count László Széchenyi, who spared no time and money to prevent Károlyi’s visits. Széchenyi was well-connected due to his marriage to Gladys Vanderbilt, the daughter of the railroad magnate. Secretary of States Hughes and Kellogg denied him a visa for years but when President Hoover took over in 1928, the new Secretary of State, Mr. Henry Stimson flatly rejected these maneuvers and on October 28, 1929 the State Department granted entry to Károlyi. The Ford Hall Forum in Boston is the oldest free public lecture series in the US and Károlyi spoke in the jam-packed auditorium. No other Hungarian has ever been invited to speak there. Notably, at the time the Hu peasantry was the most dispossessed in the region (I guess in Europe), 43% (?) had no land at all and lived as hired hands, ie. the situation was better even in Rumania, the Slovak (region) and Bulgaria. The Hu inhumanity has deep roots. As István Bibó has rightly observed in 1947, the official history of Hungary between 1848 and 1947 was by and large a fabrication. That tradition was rejuvenated by the Hungarian Bolsheviks in 1948, and continued on until 1990. There was a short period when power politics took itself out of the equation, but ever since that affinity fraud artist, the ex-Bolshie Orbán took over in 2010, the state has once again moved into the hallowed halls of academia, to make a mockery of the truth. Orbán has his own historical institute under the jurisdiction of the Hungarian Prime Minister’s Office (try that in Berlin, London. Ottawa, or Washington. Even that eye sore in the White House would not attempt such a gross out) and Hungarian historiography is once again enthusiastically engaged in the manufacture of white supremacist, christian-national mythologies. The century long slander against Károlyi, Jászi, etc. are the low notes of that Hungarian Rhapsody whose latest measures try to portray Horthy as a savior of the Jews. (Give Viktor and Bibi a chance and they may even arrange for him to be anointed as one of the righteous ones, as Randy Braham, and Elie Wiezel twist in their graves). Thank you Mr Lázár for showing us the tip of the iceberg. If only American Hungarians were as rational as they were when Károlyi visited the US in 1929. Most of them today are trampling over each other to service Hungary’s crooked little autocrat who has diverted his people as Horthy and Tisza did, from the path of justice, the rule of law and sustainable development. 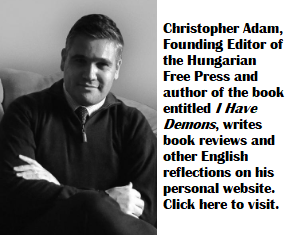 Gyuri and András, it is a true pleasure just to read your short, but very strong, eloquent and encouraging summary – straightening out this shameful history distorting sin in our minds, whose views are the same, although not as deep as yours. Thank You!